What is aid? Most people would agree with the dictionary that says aid is “material help given by one country to another” – and would expect aid to go to those most in need. But almost a fifth of what the OECD’s Development Assistance Committee counts as aid never leaves donor countries, as the research group Development Initiatives revealed in a report last September. And a surprising amount of aid is going to countries that are far from being the poorest. Without a clearer definition of “aid”, in other words, the targets to which countries commit themselves are largely meaningless – and the countries that really need aid are not benefiting. So it’s timely that the rules set back in 1969 about what counts as aid –the OECD’s definition of “official development assistance”– are up for review later this year. Education has much to gain from clearer, fairer new rules. Currently, as shown in our recently released 2013/4 EFA Global Monitoring Report, a quarter of direct aid to education never leaves donor countries, equivalent to $3.2 billion over the year 2010-2011. These funds are instead spent on scholarships and “student imputed costs” – the costs of foreign students studying in universities in donor countries. And, while much of the aid in the form of technical assistance is used to support governments in development countries, there is always a component that is spent in the donor country – but this distinction is currently not possible based on the available aid statistics. In addition, the money going to scholarships has also mostly been going to upper middle income countries. From 2010-2011, China was the largest recipient of scholarship-related aid, receiving around a fifth of the total. This “aid” to China totaled more than the aid received by some of the poorest countries for basic education. For instance, on average over 2010–2011, donors – primarily Germany and Japan – disbursed US$656 million per year to China for scholarships and student imputed costs, which was 77 times the amount of aid disbursed to Chad for basic education over the same period, and 37 times the amount given to Niger. 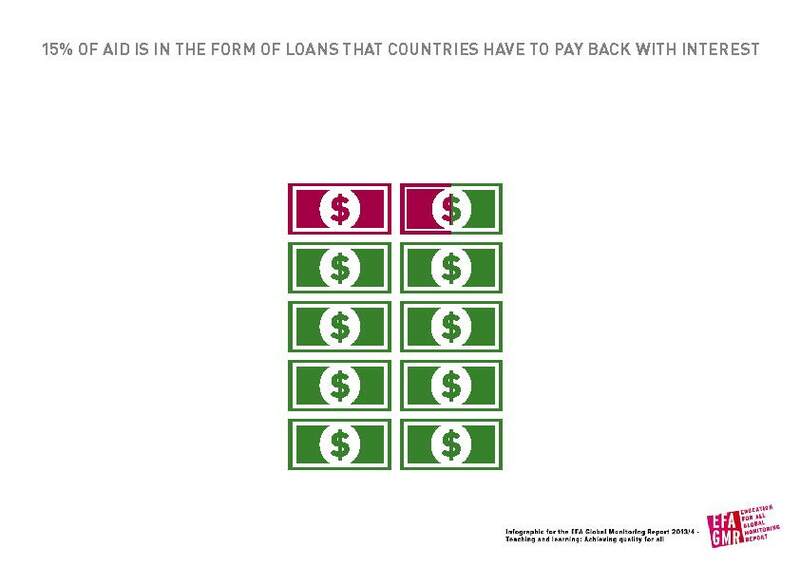 The current elastic definition of aid also covers a kind of donor contribution can actually harm rather than help: 15% of aid is in the form of loans that countries have to pay back at concessional interest rates. This deprives poorer countries of resources that they could spend on education. To make matters worse, loans with an interest rate of 10% are deemed ‘concessional’ under current rules, but with market rates at a historic low of around 3% to 5%, these ‘concessions’ are not concessional at all. At the extreme, donors may even be making interest on the ‘aid’ they’re giving to poorer countries. It is clearly time for the definition of aid to be tightened. The aid landscape would change dramatically if new definitions of aid excluded amounts spent on scholarships and loans. Germany, the largest donor of direct aid to education in 2010–2011, would fall to fifth place, and France would drop two places to fourth-largest. The World Bank would fall from third to 14th place, since a large share of its funding is in the form of loans. The United Kingdom and United States, which give negligible amounts of aid to education in the form of loans or student imputed costs, would jump from sixth and seventh places to first and second. To build a full picture of financing for education, it is also important to give countries credit for the aid that they contribute via pooled funds. For example, donors should report the amount they give to the Global Partnership for Education (GPE) and, likewise, the GPE should report what it disburses to countries. In 2011, GPE was the fourth-largest donor to low and lower middle income countries. If the GPE’s funds increase after its forthcoming replenishment meeting, as we hope, it will be even more important that the way these funds are distributed is centrally reported. Once we have agreed on the definition of aid, we must then also be sure that the contributions are targeting those most in need. There are vast inequalities in progress towards education goals. Our latest report shows that the poorest girls are 60 years behind the richest boys in achieving universal completion of primary school, for example. If we are to rectify these huge gaps in progress in education after 2015, we must be sure to agree on what constitutes real aid, and then target our resources – financial and technical – to those most in need. This entry was posted in Africa, Aid, Arab States, Asia, Basic education, Developed countries, Developing countries, Donors, Equality, Equity, Finance, Out-of-school children, Post-2015 development framework and tagged aid, basic education, developing countries, donor, donors, education, Education for All, finance, financing, Global Monitoring Report, governance, post-2015, primary education. Bookmark the permalink. Yes, this is a nice article, and we should think like this. Govt and society need to take responsibility for the poor education. The costs for education are surely a matter of concern and due to which the gap between poor and rich is widening. This issue needs to be tackled with care and the above article has given a good insight into the same.